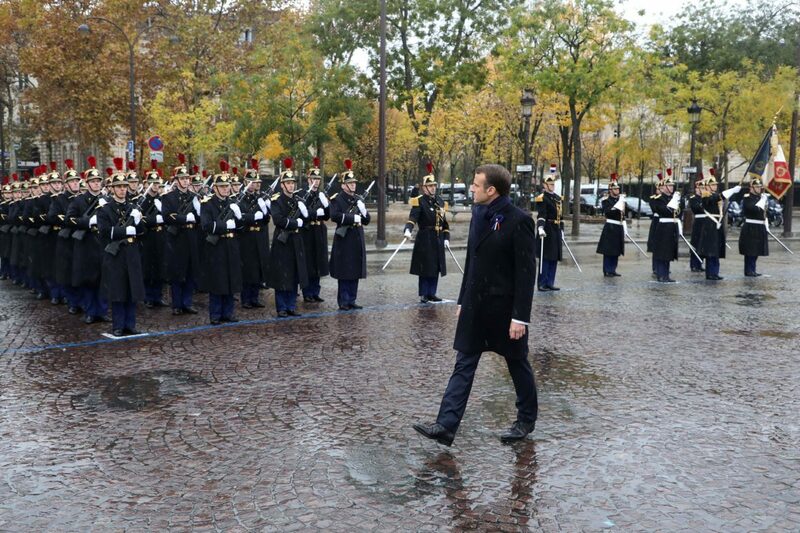 PARIS — Europe must increase military spending, but the money should go to European, not American companies, French President Emmanuel Macron said in an interview in which he delivered a rebuke to Donald Trump’s self-proclaimed nationalism. In the CNN interview, Macron was asked about Trump’s tweet, shortly after arriving in Paris on Friday night, accusing Macron of being “very insulting” by calling for the creation of an EU army to help protect against threats, including Russia, China and even the United States. France just happens also to have one of Europe’s biggest defense manufacturing industries. By mentioning the U.S., Macron was specifically referring to Trump’s withdrawal from the Intermediate-range Nuclear Forces (INF) treaty, as well as more broadly to Trump’s pullback from transatlantic cooperation, including on the Iran nuclear deal. “I don’t know, I’m not the one to comment on his tweet,” Macron said. “I always prefer having direct discussion or answering questions [than] making my diplomacy through tweets.” At a meeting between the two leaders on Saturday at the Elysée Palace, Macron seemed to work to smooth things over, by repeatedly saying that he supports Trump’s calling for increased military spending by European NATO allies. However, in the CNN interview, Macron clarified his point to say that he very much wants to see European allies not only spend more but to develop their own autonomous military capabilities and to buy European-made materials. France just happens also to have one of Europe’s biggest defense manufacturing industries. Macron’s endorsement of an “EU army” is hardly shared by all European leaders. Indeed, the idea is viewed as the ultimate incarnation of European defense and security — a goal for some leaders but a bridge too far for many who still view military and defense as sovereign, national responsibilities. Macron said he respects Trump’s efforts to fulfill promises made to U.S. voters, even where those goals represent disagreements with Macron’s own policy views. The French president called for greater solidarity among EU countries, including Hungary and Poland. Macron also talked in the interview about the need to strength the euro’s position as a global reference currency — not as a challenge to the U.S. dollar but as an alternative for purposes of stability. The French president called for greater solidarity among EU countries, including Hungary and Poland, where politics in recent years has been characterized by right-wing populism.